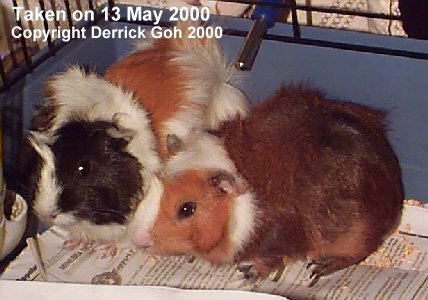 This page is dedicated to my dearly departed cavies as well as those that have been given away. I shan't described the events that led to the cavy's passing because I'm sure people will fall asleep reading it. However I will explain why I gave away the cavy. If I have pics, I'll add them here. If not, it'll just be the basic info about the cavy. Cause of death: Flu. Vet said he was very likely already ill when I got him from Aquapet Thomson Plaza. Cause of death: She had diahorrea but was on medication. When I found her, her nose & mouth were wet. So I really don't know what happened. Pikachu is on the right. Mum Oreo is on the left. Born on 15 March 2000, his birth was unexpected 'cos neither Melissa or I knew Oreo was pregnant. I saw him grow from a tiny little furball to his existing size & needless to say, it was a tough decision giving him away but I really had no other choice. I didn't want my females getting pregnant & neutering is too risky. I don't have the time to maintain 2 seperate cages, so seperating him from the gals is not possible. He is just so cute especially when he stretches out & extends his legs as he yawns & exposes his teeth. I fondly nicknamed him "Big Nose" 'cos he has the pointiest snout of my cavies. I bought another female from Melissa (I now have 3 females in the cage) & although she is very adorable, I'll never forget Pikachu. My only regret is I wouldn't get to see him when he's a full grown adult. The gal who bought Pikachu on 17 June 2000 was referred to me by Melissa, so I hope she'll take good care of Pikachu.